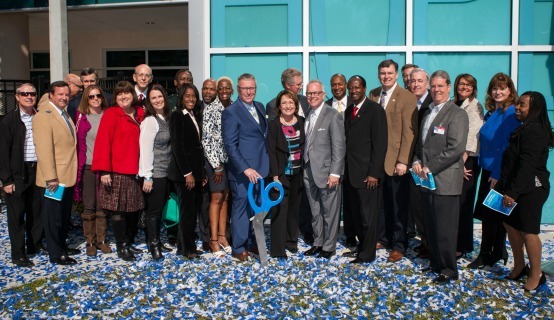 Orange County Mayor Teresa Jacobs recently joined more than 200 members of the community to celebrate the grand opening of the Men’s Service Center at Coalition for the Homeless of Central Florida. The new two-story, 32,000-sq-ft. residential facility focuses on accommodating homeless men and providing case-managed services to assist 250 men at any one time on their journey to independence. The nonprofit – which serves more than 600 men, women and children on an average night – now provides them with case management, access to mental-health services, job-skills training, education and life skills, along with an initiative directed to homeless veterans. In addition, there are beds for the physically disabled and 50 beds are dedicated to substance- and alcohol-abuse recovery. Mayor Jacobs considers homelessness in the community a priority and is working with the Board of County Commissioners and a wide network of community partners to boost funding and expand initiatives to impact homelessness, including housing, prevention and related family programs. The opening of the Men’s Service Center represents a dramatic shift in how the region provides homeless services. The bold step is due in part to the leadership of Mayor Jacobs in helping to secure more than $5 million in support from Orange County Government through the federal-funded Community Development Block Grant (CDBG) program. In addition, the City of Orlando provided $1.6 million in capital campaign support through the CDBG program. Due to these efforts, the Coalition was able to move forward with this critically needed project. The new Men’s Service Center better serves homeless men as well as the entire community. The cost per man/per night is just $11.62 and the more self-sufficient men become, the fewer social services they will ultimately need to utilize. Since beginning operation in late June 2014, 81 men have moved into permanent housing in the community and 51 have moved into transitional housing. A collection of photos from the opening of the Men’s Service Center are available for use by the media and are located on Flickr.